§0. The picture on the cover makes me think about heroes, athletes, and poetry. What we see is an Amazon, riding on horseback, engaged in mortal combat with a male adversary. As I have shown in previous postings about Amazons, especially in my comments on Antiope, queen of the Amazons, in Classical Inquiries 2017.10.18, these female warriors were considered to be not only heroes but even cult heroes. Also, Amazons were paragons of athleticism, which we see amply displayed in the many surviving references in the visual arts, as here, to their expertise in riding horses. The athleticism of these Amazons is typical of heroes in general, both male and female, who are figured by poetry as models in the mythical past for athletes in the historical present of the ancient Greeks. Mosaic with Amazonomachy (4th century CE), in the Louvre. Image via Wikimedia Commons. §1. The example of Amazons is a good starting point, I think, for a reconsideration of the hero Hippolytus as we see him figured in the poetry of Euripides. In the posting for 2018.08.03, I focused on Hippolytus in his role as hunter. But here in the posting for 2018.08.10 the focus shifts to the role of Hippolytus as athlete—more specifically, as a horseman. In the Hippolytus of Euripides, we read that Phaedra, in her unrequited love for Hippolytus, identifies with his role not only as a hunter but also as a horseman—even more specifically, as a charioteer. 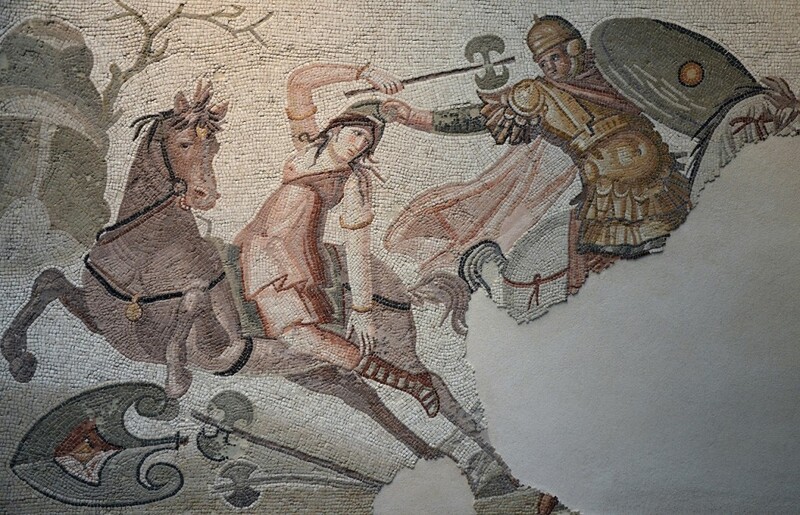 Although I can find no pictures imagining Phaedra as a horsewoman, what she would look like is amply illustrated by pictures imagining Amazons in such a role. The picture that I showed on the cover—and that I show here again—is a splendid example. And the athleticism of Amazons in general is most relevant to Hippolytus the athlete, since his mother was Antiope, queen of the Amazons. §2. The athleticism of the hero Hippolytus, as I sketch it here, is relevant to my general thinking about ancient Greek traditions linking heroes in their mythologized past, especially in their role as warriors, to athletes in the ritualized present of the athletic competitions that were held at prestigious festivals like the Olympics. Such traditions, mediated by poets like Pindar in the fifth century BCE, will be the subject of a new book I am planning, which will have as its title Ancient Greek Heroes, Athletes, Poets. §3. 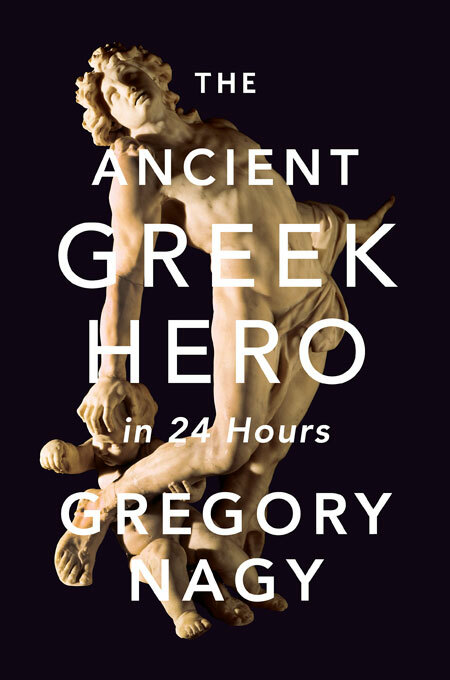 This new book, abbreviated here as AGHAP, will be a companion to a new edition that is being planned for an older book, The Ancient Greek Hero in 24 Hours, which was originally published in 2013—and which I abbreviate as H24H. Most of what I said in H24H about heroes, athletes, and poetry will be omitted in the new edition, h24h, and reworked as the core of AGHAP. 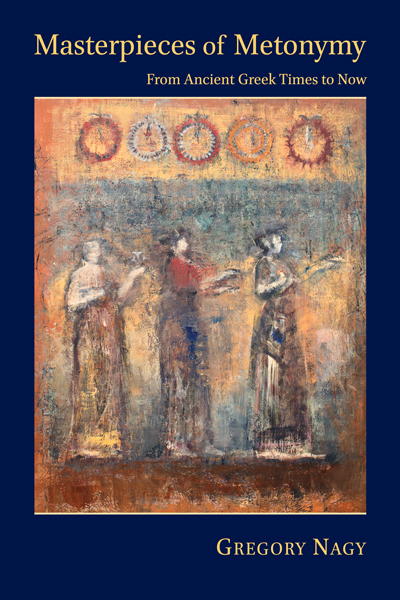 The twofold result, it is hoped, is that (1) h24h will now become a more streamlined introduction to ancient Greek heroes in general and (2) AGHAP will present a more focused look at ancient Greek athletics as linked by poetry to the heroic past. |228 My lady Artemis! You who preside over the lagoon by the sea! |229 You are where the place is for exercising [gumnasia], and it thunders with horses’ hooves! |230 Oh, if only I could be there, on your grounds, |231 masterfully driving Venetian horses! In my analysis at H24H 20§52, I had interpreted this longing of Phaedra as an expression of her desire to be with Hippolytus, who habitually drives his own chariot on the sands of that same long beach that lines the lagoon by the sea. I still stand by that interpretation, but now I see more. The longing of Phaedra translates also into a desire to look like the goddess Artemis, who is said here to preside over the lagoon lined by the beach where Hippolytus is performing his gymnastic ‘exercises’, as expressed by the suggestive word gumnasia. And what exactly are these exercises in athleticism? The answer is, Hippolytus is racing his chariot, and the goddess Artemis is presiding over the place where he performs his athletic feats. So, since Phaedra is expressing a desire to drive a chariot at this place, she can be seen as a lookalike of Artemis—even as a stand-in for the goddess herself. Similarly, as I argued about the Hippolytus of Euripides in the posting for 2018.08.03, the longing expressed by Phaedra at verses 219–222 to be hunting in the wilderness translates into a passionate desire to be the lookalike of Artemis, even to become the goddess herself. 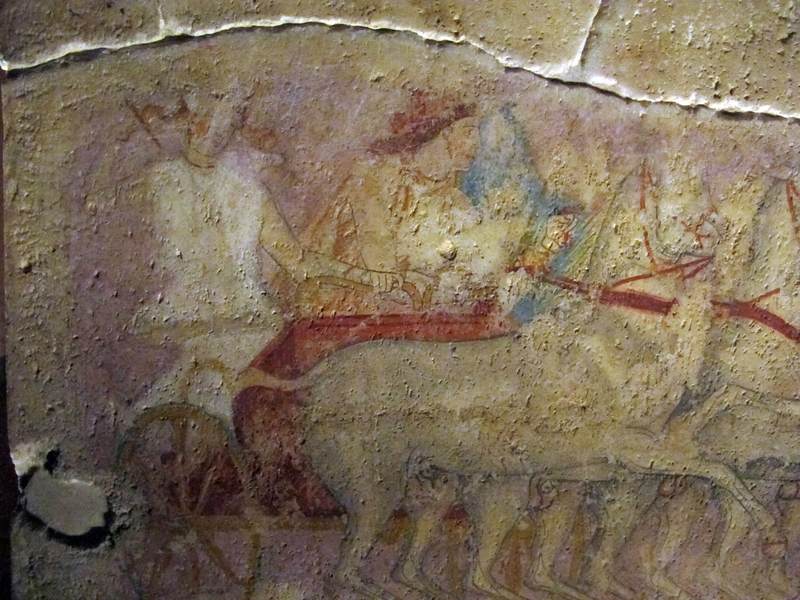 Sarcophagus with Amazons. Image via Wikimedia Commons. In other situations, however, as we have already seen in the cover illustration, Amazons are pictured as riding on their horses. I find it relevant to note here that the riding of horses and the driving of four-horse chariots were parallel feats of athleticism at the Olympics and at other festivals. §6. I conclude for now by returning to the athleticism of the hero Hippolytus. No matter how accomplished he had been as a chariot driver, his doom as a hero was death-by-chariot. I share here a most vivid visualization of this heroic death. 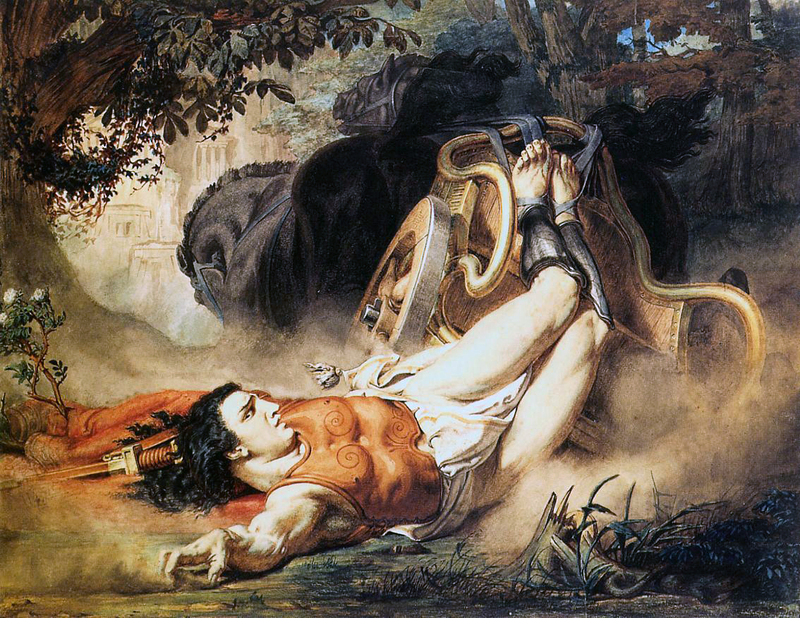 “The Death of Hippolytus” (1860). Lawrence Alma-Tadema (1836–1912). Image via Wikimedia Commons. As I will be arguing at some length in AGHAP, the catastrophe suffered by this hero in the mythologized past is meant to result in the viability of chariot racing as a notionally everlasting institution in the ritualized present of athletic competition. And the constellation of the Auriga will be the eternal witness.